It goes without saying that law enforcement officers spend countless hours driving in the performance of their duty. According to the Department of Criminal Justice Training 2018 Comprehensive Survey, law enforcement officers throughout the state drive a myriad of front-wheel, rear-wheel and all-wheel vehicles on a daily basis as they crisscross the roads in their respective communities. With all the miles logged, it is reasonable to think law enforcement agencies would require officers to undergo regular driving training. Between 2008 and 2017, nearly a quarter of the nation’s 1,511 law enforcement officers killed in the line of duty died in motor vehicle accidents, according to the National Law Enforcement Officers Memorial Fund website. The reasons for the number of fatal wrecks involving law enforcement are many, but a common denominator is a lack of training, Glasgow Police Chief Guy Howie said. Howie’s agency was among the 34.13 percent who answered “Yes” to the question. For the Glasgow chief, it’s simply a case of practice makes perfect. Driving training is equally as important as firearms or any other training, Berea Police Chief David Gregory said. To that end, Berea appointed Sgt. Ron Ward as its driving training instructor in August 2017. Berea responded “Yes” to having an in-house driving training instructor, according to the survey. Since Berea began emphasizing driving training, the agency has seen tangible results. In the end, the decision to require yearly driving training and an in-house instructor boils down to officer safety and fiscal responsibility for the agency. From vehicles and guns to the implementation of new technology, law enforcement agencies are tasked with finding the best methods to combat crime. With that in mind, a new question the comprehensive survey asked was about the use of drones. 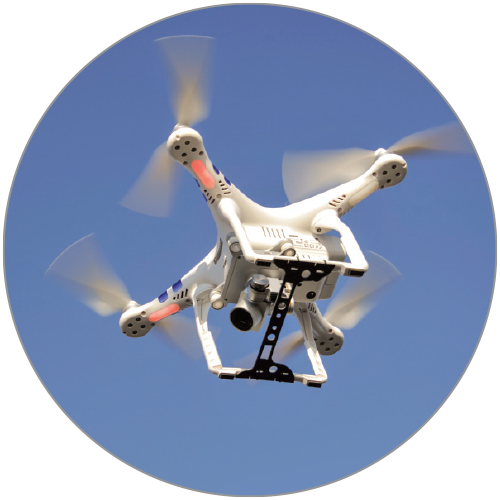 In all, 202 agencies responded to this question, with 12 percent responding “Yes” to utilizing a drone in their operations. Georgetown Police Chief Mike Bosse said his agency began using its drone in 2016. The decision to add a drone into its arsenal paid near-immediate dividends, Bosse said. Georgetown has also successfully used the drone to locate stolen vehicles and missing people, Bosse said. “We have assisted BACKUPPS (Bluegrass and Central Kentucky Unified Police Protection System) agencies in finding a stolen truck in a rural area and used it to find a lost grandmother and her granddaughter, also in a rural area,” Bosse said. Georgetown spent $4,000 for the drone and another $12,000 for the infrared camera. The department has three Federal Aviation Administration-certified drone pilots and three support personnel. 60 percent of those who responded to the survey were aware of the Violent Person File. This file is located in the Criminal Justice Information Services (CJIS) system. It is designed to alert law enforcement officers that an individual they encounter may show violence toward law enforcement. But only 34 percent (of the agencies) reported entering individuals into the system. For additional information about salaries, insurance, retirement and more, click here to download a PDF of the entire 2018 Comprehensive Survey.